Ship model for bonding. Size: 1: 400; 67.0 cm. Packaging includes: 262 glues and other accessories and accessories. 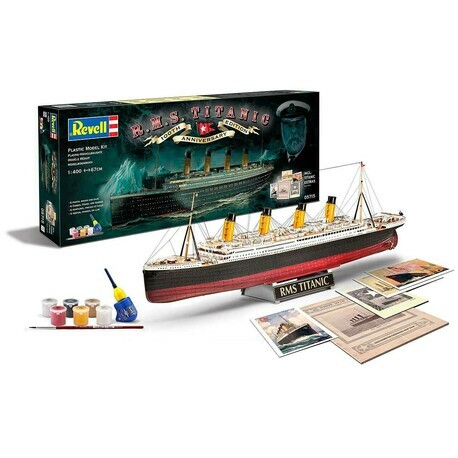 The gift set comes in a special informative package to mark the "100th anniversary of Titanic sinking". In addition to the 1: 400 plastic model, this exclusive set includes 6 basic colors (88, 301, 302, 310, 331, 374), brush and glue. The package also includes special attachments representing original reproductions of historical documents. Namely, they are: 3 postcards, first-class menus and a 28-page promotional brochure from White Star Line. The Titanic Keel was laid on March 31, 1909, about fifteen weeks after his sister Olympic ship. Both steamers built in parallel and were equipped to the highest degree of elegance and luxury of their time. White Star Line wanted to use it for its prestigious transatlantic cruises. Two years later, on May 31, 1911, Harland " Wolff Shipyard in Northern Ireland was handed over to his new owners by Olympic, the Titanic was launched on the same day fifteen minutes after noon. With a length of 269.04 m, a width of 28.19 m and a tonnage of 46 329 BRT was larger than any ship built until then, and until 1912 it was recognized as the largest ship in the world. Captain Edward John Smith originally assumed command of the Olympic boat, but later moved to Titanic on his first voyage, which began on Wednesday, April 10, 1912, when the ship set off from Southampton. As if fate did not bring any good to them, they had missed the ship New York, which was anchored here, when leaving the harbor. Titanic then made plans to stop in Cherbourg (France) and then in Queenstown (Ireland) before heading out to the open sea towards New York (USA). The voyage continued without any extraordinary events until Sunday, April 14, when at about 23 hours and 40 minutes (shipping time) the patrol bell rang out of alarm due to the approaching glacier. The ship, however, wiped the starboard cork and, after two hours and forty minutes after the crash, sank into the icy waters of the Atlantic Ocean." Only 712 passengers survived the catastrophe and Captain Smith fell to the bottom and his boat. © TMG (Titanic-Museum-Germany), under the guidance of the historian and expert on the Titanic ship Andreas Pfeffer. Caution! / Not suitable for children under 8 years of age. Children may only use the product under the supervision of an adult. Instructions for use: Water-soluble acrylic paint. Mix the color well before using it. Apply with a brush or spraying on a dry, clean surface. Non-combustible base, quickly drying - non-colorable after 1 hour, completely dries in 2-3 hours, according to layer thickness. Dilute with water if necessary. By using an unsuitable thinner, the paint can be destroyed! It is cleaned with Revell Aqua Color Clean thinner. For spraying, dilution of up to 20-25% is recommended. Brush the paint and tools immediately after use with water. Close the container tightly after use. When opening, use as soon as possible, the air color dries out. Protect from frost. It contains a mixture of 5-chloro-2-methylisothiazole-3 (2H) -one and 2-methyl-isothiazole-3 (2H) -one with magnesium chloride and magnesium nitrate." May cause an allergic reaction.